It was a week of mixed reactions for Nigerians as they woke up to President Muhammadu Buhari’s declaration of his intention to seek a second term in office. And of course, the opposition party, PDP in its reaction referred to the declaration as a ‘Desperate and a mere show of interest’. It was also a sad day for some, as Nigerians remembered the Chibok schoolgirls, four years after their abduction. President Muhammadu Buhari on Monday declared his intention to run for the second term after months of speculation. The President said this at a meeting of the National Executive Committee (NEC) of the ruling All Progressives Congress (APC) leadership. Buhari’s decision to officially declare the intention to run for the second term follows various speculations. Many APC governors had however endorsed him for the second term. Nigerians reacted to President Muhammadu Buhari’s declaration of the intention to seek re-election. They took to Twitter to voice their reaction to the President’s declaration. While some were excited by the news, others expressed disapproval. Some Nigerians in their reaction were of the opinion that Nigeria deserves a younger president, noting that President Buhari deserves to ‘rest’. 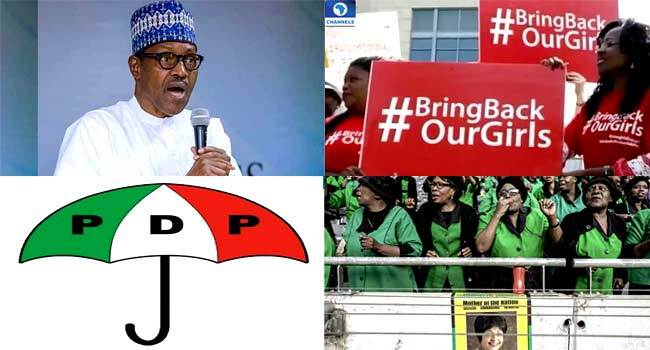 The Peoples Democratic Party (PDP) described the declaration of intention made by President Muhammadu Buhari to seek a second term in office as a mere show of interest. The PDP also referred to the President’s declaration as internal affairs by the party. According to the PDP, “President Buhari has been placed among the ranks of aspirants seeking to be the President of the Federal Republic, effective May 29, 2019. “Until he becomes the candidate of the APC, we will not spend precious time on his mere show of interest”. The All Progressives Congress (APC) has explained why Nigerians should re-elect President Muhammadu Buhari in 2019. Speaking during his appearance on Channels Television’s Politics Today on Monday, the National Publicity Secretary of the party, Bolaji Abdullahi, believes re-electing the President is in the interest of the nation. Mr Abdullahi said the President’s declaration did not come as a surprise as many party leaders and members across the country have been appealing to him to make his intention known. The Federal Government says it will not be intimidated by any person(s) or group(s) to stop revealing the names of those who allegedly looted the nation’s treasury. Minister of Information, Mr Lai Mohammed, said this in Kwara State during a condolence visit to the state government over the recent bank robbery in Offa. He told reporters in the state on Sunday that the government would release another batch of alleged looters’ list soon and was not bothered by any litigation threat whatsoever. “We want to make it clear that no amount of intimidation from any side will prevent the government from releasing the next batch of looters’ list,” Mohammed stated. “Honestly, what you have seen so far is the tip of the iceberg. When the next list comes out, you will see that many people that you did not suspect also partook in this national looting,” he added. Buhari’s Re-election, A Desperate Move? The Peoples Democratic Party (PDP) has taken a swipe at President Muhammadu Buhari, claiming he made a ‘desperate’ declaration to seek re-election in 2019. National Publicity Secretary of the party, Mr Kola Ologbondiyan, criticised the President’s declaration during his appearance on Channels Television’s Sunrise Daily on Wednesday. He purported that the President declaring his intention to seek a re-election at this time would have an effect on the nation, stressing that Nigeria does not have a system that can run on its own if its president is campaigning. Some members of the Senate were in disagreement on Thursday after Senator Enyinaya Abaribe questioned the competence of President Muhammadu Buhari over the security situation in the country. Senator Abaribe is a member of the Peoples Democratic Party (PDP) and the lawmaker representing Abia Central at the National Assembly in Abuja. Speaking on the floor of the Red Chamber, the lawmaker was concerned over the comments made by President Buhari recently in London, that the killer herdsmen were allegedly trained and armed by the late Former President of Libya, Muammar Gaddafi. “When a Commander-in-Chief cannot take care of invaders invading Nigeria, why is he still a Commander-in-Chief; Why do we still continue to indulge this president that, everywhere, goes along to tell everyone outside this country that he is totally incompetent? He questioned. The Chief of Army Staff, Lieutenant General Tukur Buratai, has set up a committee to investigate claims of the Army’s complicity in the clashes between herdsmen and farmers in Taraba State. Former Chief of Army Staff, Lieutenant General Theophilus Danjuma (retd) last month accused the Nigerian Armed Forces of complicity in the killings in Taraba, Benue and other “riverine states” in the country. Speaking during Taraba State University convocation, he alleged that the military was not neutral and was covering those behind the attacks. General Buratai while setting up the committee on Monday said it was necessary to clear the reputation of the Nigerian Army, adding that such allegation cannot be ignored. “Statements of this nature could damage the reputation of the armed forces of Nigeria and thus cannot be ignored if the Nigerians Army will continue to earn the trust of the Nigerian populace. “Thus, it became imperative for the Nigerian Army to set up this panel to confirm the veracity or otherwise of these allegations, the need for the Nigerian army to get it very clear and to get its name out of these unnecessary allegations,” he said. President Muhammadu Buhari has written to the Senate seeking approval for 26 nominees. In the separate letters, President Buhari is requesting confirmation of one National Commissioner of Independent National Electoral Commission (INEC), two non-legal practitioner members of the Federal Judicial Service Commission and 23 other members of the National Population Commission (NPC). In the first letter, the President is requesting the confirmation of Barrister Festus Okoye as National Commissioner of INEC and Abba Ali (Katsina-North west) and Mohammed Sagir (Niger-North central) as Non-Legal Practitioner Members of the Federal Judicial Service Commission. President Buhari in the second letter also forwarded the names of twenty-three nominees for appointment as members of the National Population Commission. The Minister of Finance, Mrs Kemi Adeosun, has denied controversy surrounding the repatriated funds looted by the late former military Head of State, General Sanni Abacha. Reports had emerged that the minister allegedly wrote a letter to President Muhammadu Buhari, blocking the payment of $16.9million fees to lawyers for the repatriation of the funds. Similarly, in the statement, the minister insisted that there was no time she wrote a “strongly-worded letter to the President” or any member of the Federal Executive Council (FEC), objecting to the payment of fees to two lawyers for the recovery of Abacha funds. The minister also denied claims of controversy surrounding the Abacha recovery, disclosing that the sum of US$322,515,931.83 was received into a Special Account in the Central Bank of Nigeria on December 18, 2017, from the Swiss Government. Minister for Solid Minerals, Mr Kayode Fayemi, has officially declared his intention to join the 2018 governorship race ahead of the Ekiti State polls. He publicly announced his ambition on Saturday in Ado-Ekiti, the state capital promising to restore the ‘Land of Honour’ to its former glory. “We are on the march again. We are not on the march again simply because we want to be addressed as His Excellency. We not on the march again simply because of a position,” he said. President Muhammadu Buhari has said that the remaining Chibok girls in Boko Haram captivity will not be forgotten as long as he remains Commander-In-Chief of the Armed Forces. The President’s comments come a day to the fourth anniversary of the abduction of the girls from the Government Girls Secondary School in Chibok, Borno State. In a series of tweets, the Special Assistant to the President on Media and Publicity, Mr Garba Shehu, said President Buhari assured the parents of the girls that “their daughters will never be forgotten or abandoned to their fate”. “Don’t imagine for a moment that we have forgotten about our daughters or that we consider their freedom a lost course,” he quoted the President, who is in London, as saying. The President encouraged the parents to keep their hopes alive, noting that the recovery of more than a 100 of the girls that were kidnapped through the Federal Government’s determined effort should give confidence that all “hope is not lost”. April 14, 2014, marked four years since the Boko Haram group abducted more than 200 schoolgirls from the Government Girls Secondary School, Chibok, a town in Borno state, northeast Nigeria. Their abduction drew international attention to the activities of the armed group, with several world leaders including former British Prime Minister, David Cameron, as well as the wife of the then U.S. President, Michelle Obama, former United Nations Secretary-General, Ban Ki-moon, calling for the girls’ release. Since then, 107 girls have either been found, released or escaped. Four years on, 112 girls are still being held by the group as campaigners for their freedom continue to press the Federal Government for their release. South Africa on Saturday laid to rest anti-apartheid icon and Nelson Mandela’s former wife Winnie Mandela with full state honours at a stadium funeral in Soweto. Tens of thousands of mourners burst into loud cheers as the casket carrying her remains was wheeled into the stadium, less than two kilometres from her home. The casket draped with the multi-coloured South African flag was placed in the middle of the 37,500-seater stadium in front of a stage, decked in white and yellow flowers. Mourners dressed in the colours of the ruling African National Congress (ANC), as well those of the radical opposition Economic Freedom Fighters (EFF), sang “there’s no-one like Winnie”, an adapted popular liberation struggle song. The ceremony concludes 10 days of national mourning during which time thousands of South Africans have paid tribute to the “Mother of the Nation” at her Soweto home and elsewhere.